T&T’s foreign policy towards Venezuela is in shambles and Rowley would be well advised to heed UNC leader Mrs. Kamla Persad Bissessar’s advice and change course. We need something more nuanced that takes on board the many conflicting geopolitical and other issues at play. That very subtle policy of ‘active neutrality” requires a level of diplomatic adroitness, sophistication and finesse clearly lacking under a Moses led Ministry and a demoralized cadre of foreign policy officials. It is also inconsistent with Keith Rowley’s instinct to a binary, “us vs. them” pavement diplomacy. 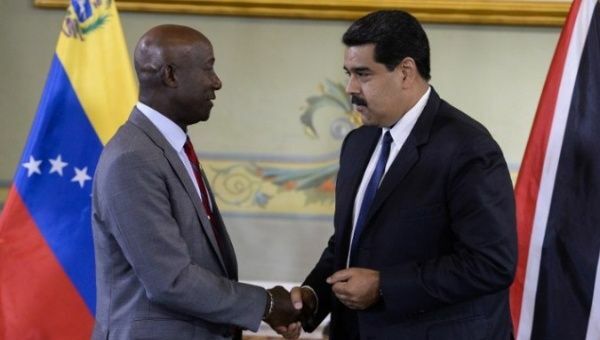 Active neutrality would have dictated that if T&T chose to attend Maduro’s inauguration last week Thursday, we would have sent an Ambassador instead of the high level representation of Foreign Minister, Dennis Moses. That way we would have acknowledged our relationship with the existing Government in Venezuela by our attendance. At the same time we would have preserved our neutrality by the level of our representation. That is diplomacy 101. But right now we do not have an Ambassador in Venezuela given Ambassador Paul Byam’s recent transfer to the post of Inspector of Missions. As it stands Rowley has put all our eggs in Maduro’s basket and it neither makes sense nor does it serve our strategic interests. It does not even help Maduro. When Rowley criticized OAS Secretary General, Luis Almagro in Chile in 2017, it signified his support for Maduro. Our main trading partners must have taken note. T&T is now very much at odds with fellow CARICOM state Guyana on Venezuela. How will this help us in future attempts to take advantage of energy opportunities in Guyana, which is on course to produce over 700,000 barrels of oils per day by 2020? On the 5th April 2018, Venezuelan Coast Guard vessels entered our territorial waters and seized three of our fishermen. Because of this Government’s one sided support of Maduro they did not even send a diplomatic protest note. Contrast that with Guyana going to the UN to protest Venezuela’s recent incursions in their waters. T&T is diplomatically isolated from our main trading partners the US, Canada, the EU and many of our neighbors in South America including Brazil. 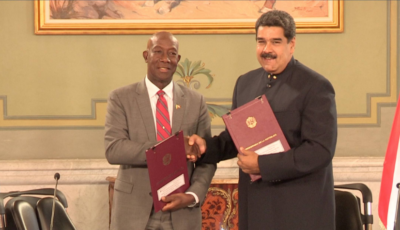 We are due to spend US $1 billion between now and 2020 on infrastructure to access gas from Venezuela’s Dragon Field, but opposition forces in Venezuela say they will not honor any agreement signed between Maduro and Rowley. Rowley and Moses are afraid to develop a refugee policy for the estimated 60,000 Venezuelans in our midst because it may offend Maduro. These Venezuelans are exposed to untold exploitation and abuse and their children cannot access our education or health facilities. We can only hope that Venezuelans will forget our treatment of them if ever circumstances dictate that some of us have to be refugees there. Most of all, there may be economic reprisals from our main trading partners. We are already on the radar of the US Senate given what we heard at the confirmation hearings of Ambassador Mondello. Dr Rowley is a believer in a very aggressive “pavement” diplomacy, seeing others as either friends or enemies. If you do not uncritically support his perspectives then you must be an imp, or you are stupid, or unpatriotic. But diplomacy is much more nuanced than Rowley’s instincts would allow. As Winston Churchill advised: “diplomacy is the art of telling people to go to hell in such a way that they ask for directions”. Mrs Persad Bissessar has called for T&T, within a CARICOM framework, to be an honest broker in Venezuela nudging them in the direction of a more sustainable future. If you think about it, that is the only way to manage the many conflicting demands that confront us in our foreign policy arrangements. But as with everything else, under Rowley, we neither have a strategic foreign policy vision, except “bury our heads in the sand and hope for the best”, nor a CARICOM policy, nor an Ambassador in Venezuela, nor a High Commissioner based in Georgetown, nor a Foreign Ministry led by a visionary and effective Minister. We must admit therefore that we are in deep, deep trouble.